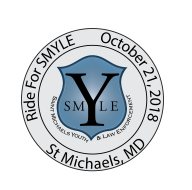 Join us on October 21, 2018 for the inaugural Ride for SMYLE Bike Tour. Riders from across the area unite!!! Come join us in beautiful Talbot County for various distances of riding to support the St Michaels Police Department’s SMYLE (St Michaels Youth and Law Enforcement) program. This ride will begin and end in St Michaels and will take you to areas such as Tilghman Island, Neavitt Landing, the Oxford-Bellevue Ferry, Oxford, Trappe and many of our beautiful back roads. Choose from 32 miles, 48 miles, 75 and 100 mile options. The 75 and 100 mile options will take you across the historic Oxford-Bellevue Ferry, with it’s beautiful views of our local waters and small towns. Show and Go times begin at 7am and we would like everyone to start on their respective courses by 9 am. The longer you want to ride, the earlier you should start. Mechanical and SAG support will wrap up at 3pm. Come and show your support for this wonderful program! A portion of the proceeds will go directly to this program, so that the youth of St Michaels can continue to have positive interactions with our local law enforcement officers. Mark your calendars and come ride with us!